Is your lawn looking a little worn-out this fall? It’s not uncommon for soil to get compacted over the summer, which can cause grasses to dry out and turn brown. It’s also not unusual for grass to stop growing in certain areas right before the temperature takes a nosedive in the winter. If you want to make sure your lawn is able to recover gracefully in the spring, it’s a good idea to aerate and overseed your lawn in the fall. Aerating your lawn will loosen up your soil. Months of mowing and summer activities can cause the soil in your lawn to become compacted, which isn’t ideal for healthy grass growth. By aerating your lawn, you can loosen up the soil and give your lawn’s roots a chance to spread further into the ground. Overseeding will fill in bare spots and thicken grasses. 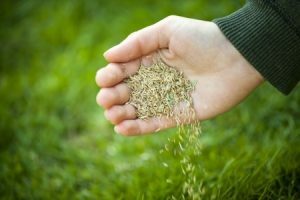 When your overseed your lawn, you’ll spread seeds over patchy areas that need to be replenished with new grass. You can also spread seeds over areas that already have grass, thus allowing your lawn to grow thicker and fuller than before. You should see a noticeable difference in the quality of your lawn once spring rolls around. Aerating will allow nutrients to reach your lawn’s roots. Aerating your lawn will do more than just loosen compacted soil. It will also allow water, air and nutrients to reach your lawn’s root zone more easily. This, in turn, can promote healthier grass growth in the future. Overseeding will mitigate weed growth. If you have bare spots in your lawn that aren’t as thick as they could be, weeds will take advantage of the opportunity to grow in its place. By aerating and overseeding your lawn now, you can prevent weeds from having a place to grow in the spring. Need a hand with your fall lawn care checklist? The team at Brother Tree would be happy to help. Give us call or contact us online to schedule your next appointment today!